A GOT to Have Cute, Compact, Clematis! I know I have featured Clematis ‘Bijou‘ in the past but this cute little Queen of the Vines just simply impresses me. I just love the compact growing habit reaching only 1 foot tall. The free flowering vine blooms early summer and frequently again in the fall. 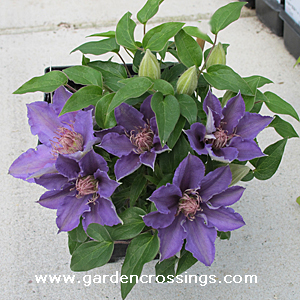 Use ‘Bijou‘ Clematis as a ground cover or plant in a combination planter. Think outside the box of using clematis as a vertical interest and take it to the ground level.